Georgians had no trouble finding good meat even in the Soviet era, and that remains true today. When I was making my very first Soviet breakfast many months ago at the start of this project, I was struggling to find a decent piece of meat to fry, so there was no talk of trying to make beef for dinner. Now that I’m in Georgia, a place that has amazing produce and meat, I can finally make roast beef that won’t be so hard it could be used as a weapon. I can serve it with a tomato and cucumber salad that will taste like the vegetables have just been picked, because they have. And make a wine-and-strawberry drink that for some reason mixes red and white wines and has sugar in it. I don’t mind doing that, since there is plenty of wine here and it’s very cheap. The drink turned out better than I expected, although I have to admit I omitted the sugar – the drink mostly tasted of strawberries and reminded me of strawberry kompot, not wine. I made up for that with enough wine over dinner though. I recently had the pleasure of making a new Georgian friend, who didn’t just drive in horrible post-flood traffic to take us out to dinner, but also offered to drive us to any region we wanted, pick our friends up from the airport at midnight and solve any of our problems – Georgian hospitality really is fabulous! – I didn’t wait 'till dessert to ask him about what he knew or remembered from the Soviet times. He said that although meat wasn’t a priority in the agricultural sector, there was enough for Georgians. The meat, along with almost every other product, was sold at markets, where consumers had to keep an eye out to not be fooled by faulty scales. Meat was also ground to make one of Georgia’s most famous dishes – khinkali. These are big dumplings with a lot of broth inside, which you’re not supposed to spill a drop of if you want to get anywhere in life in Georgia. They were sold in khinkalnye — mini cafes that only sold khinkali shop. This is Georgia's answer to Russia's pelmennye — mini cafes that sold only Russian dumplings. In a khinkalye, you would get a metal tray piled with fresh steaming khinkali and eat them standing up. I’ve seen khinkalnye around in Tbilisi, and there are certainly a few in Moscow, although they are restaurant-style — where you get to sit down, but also pay four times as much for the privilege. I still can’t believe I live in the land that grows and has grown amazing things to eat — even in the Soviet times. The anecdote Georgians tell is that when God was giving out land to peoples, the Georgians arrived last (they were probably busy sucking the last drop of broth out of those khinkali) and God gave them the piece of land he’d saved for himself. Biblical associations continued as a huge storm caused flooding in Tblisi this week. Wild animals escaped from the zoo and roamed around town. Locals got together and helped those who suffered and cleaned up the city. They take the responsibility of looking after God’s land seriously – and it rewards them with beautiful produce, meat and wine. But more about wine later! 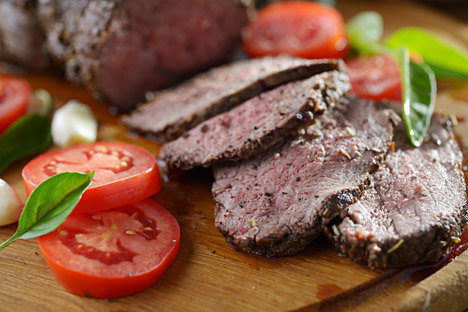 Take a piece of beef tenderloin. Wash and salt. Add oil to a baking pan and heat on the stove. Put the meat into the pan as a single piece and fry lightly. Then put in the oven and roast until it is ready. Every 10-15 minutes, baste the meat with juice from the pan. If there is not enough juice, baste with water. When the roast is ready, remove it from the pan and slice. Serve with sliced carrots and peas, potatoes and sliced horseradish.